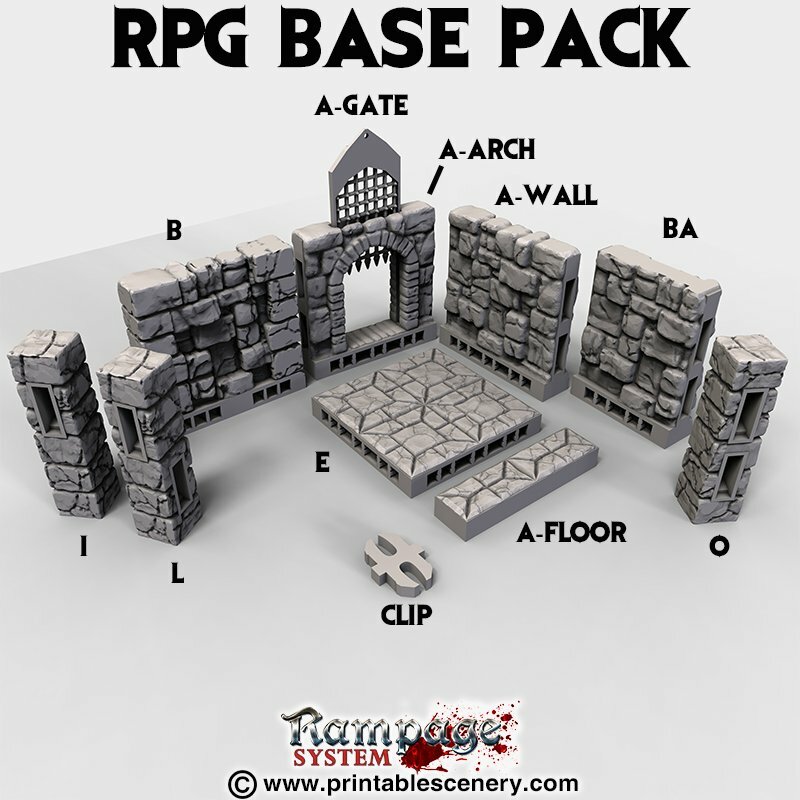 Rampage is the first truly modular interconnecting scenery building system that allows you to build everything from beautiful dungeons, to large buildings and fortifications. 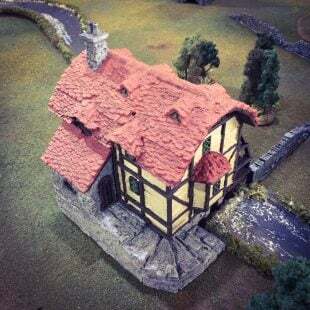 It is a versatile and highly-detailed building system for all types of tabletop or role-playing games. The Rampage Base Pack contains all you need to get started with this innovative system, including OpenLOCK clips which can connect any two pieces of scenery together. 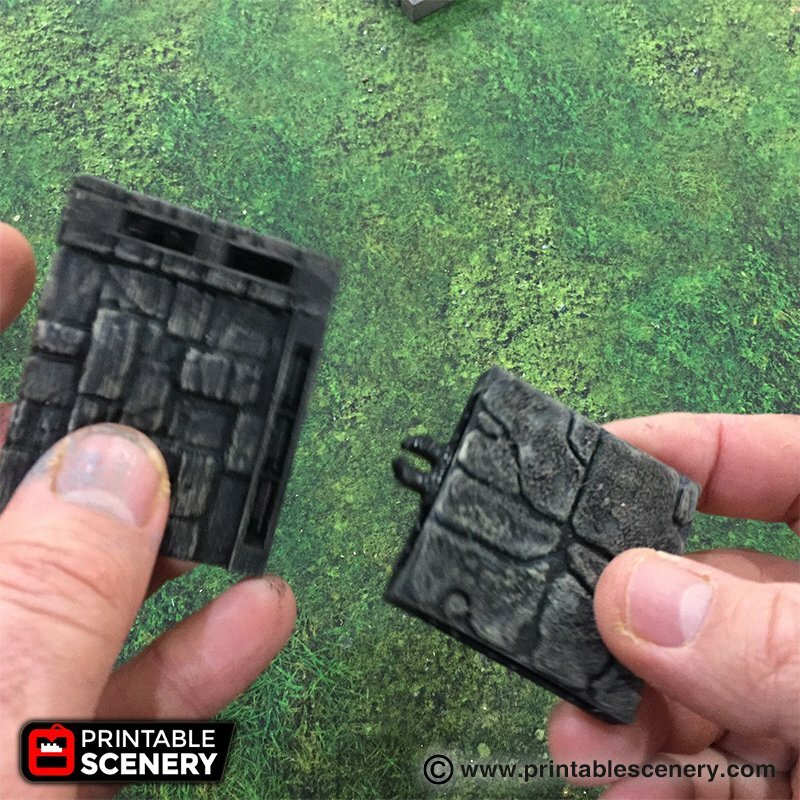 These innovative clips allow you to connect exterior walls, balconies, bridges, dungeon tiles and much, much more. 28 September 2017 – updated to clip 5.1. 28 May 2018 (version 7.0) Updated to the latest version of Triplex. 31 July 2018 (version 7.1) Update to I-Column. The Description shows to remove supports with needle nose pliers, but the Additional Information says supports aren’t needed. Is it recommended to print with supports or without? Hi. Should I print the clips with 15% infill? Or do they need more to be stronger? I normally print the clips with 15% infill, they work great. 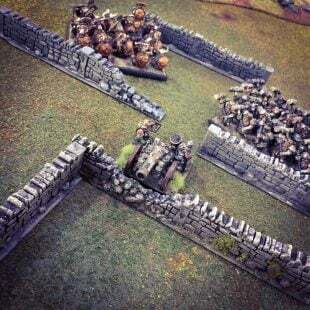 Hi Matt, I seem to have issues with the wall pieces. The more extruding stones on them always have stringing on the bottom. Quite severe actually. There are always 5-10 separate strings of filament that are just sticking into the air. I tried printing with 0.2 and 0.15 mm layers on a 0.4 mm nozzle using PLA and several variations of infill. Its always the same. It seems as if they might need supports but I was thinking that might be a bit overkill. Any recommendations? Do you print the clips on a brim or a raft? The new 6.0 version has replaced the RPG stone floor, with the TRP castle floor. Is there any chance you might include a TRP version of the original stone floor? You’re now responsible for my Prusa MK2 running ~20 hours a day… 🙂 I’m wondering whether you have any tips for printing the gate. In the .stl it’s oriented vertically, and even with a brim there’s very little surface area touching the plate. I’ve printed a few this way, but it’s been a bit hit or miss. Do you print this flat on a raft, or vertically ‘as is’ ? 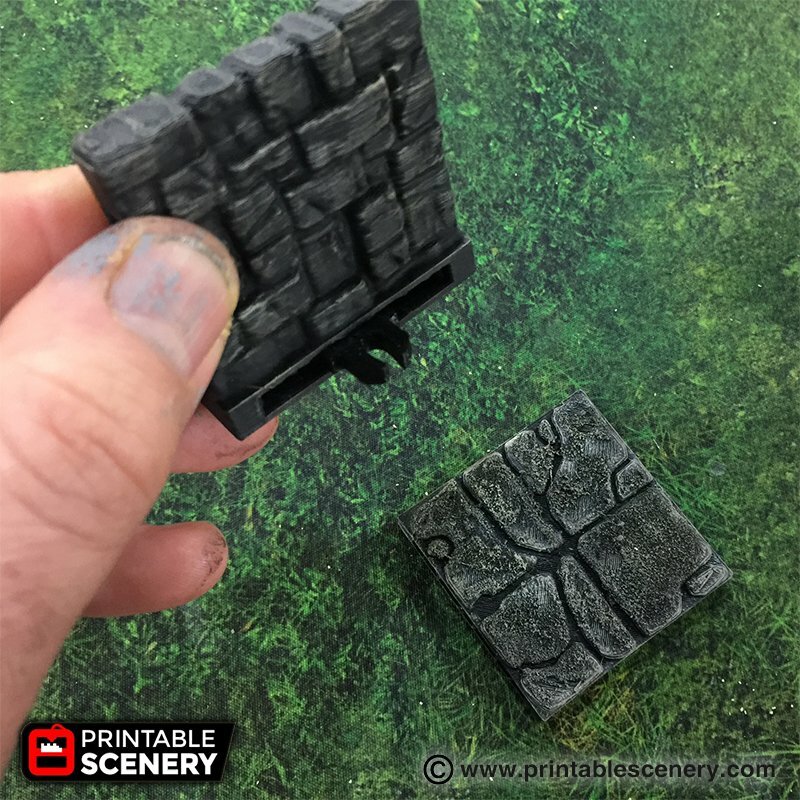 Why is the top of the BA wall in this set flat rather then stone textured like the A wall? True, I’ll make a quick fix to that now. Thanks for the heads up. 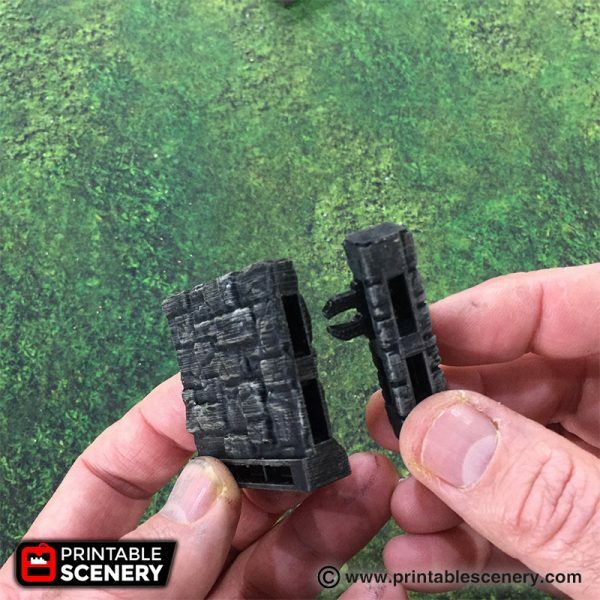 Hi, I’ve tried downloading this set, as well as printing it, and was wondering how the pieces fit together. I printed a clip (MMS_Clip-OpenLOCK 4.3) and a floor piece (A-TRP-Castle-Floor-v2.0), but when I tried to insert the clip into the floor, I couldn’t make it fit in any position. Am I missing anything? Why is there two clips in the pack, both of which looks to be equally big? Hi, I’m new to this. I’d like to know if you have a recommended print list for someone getting started, i.e. 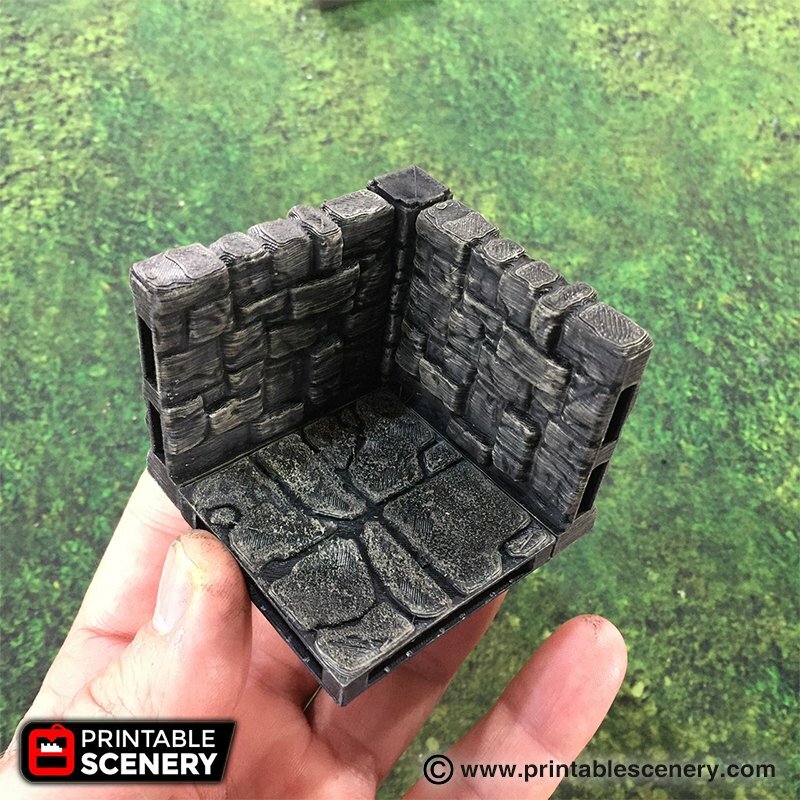 what’s a good number of walls and floors and clips to print to get started. Can you say, when the old sets updated to TRP? 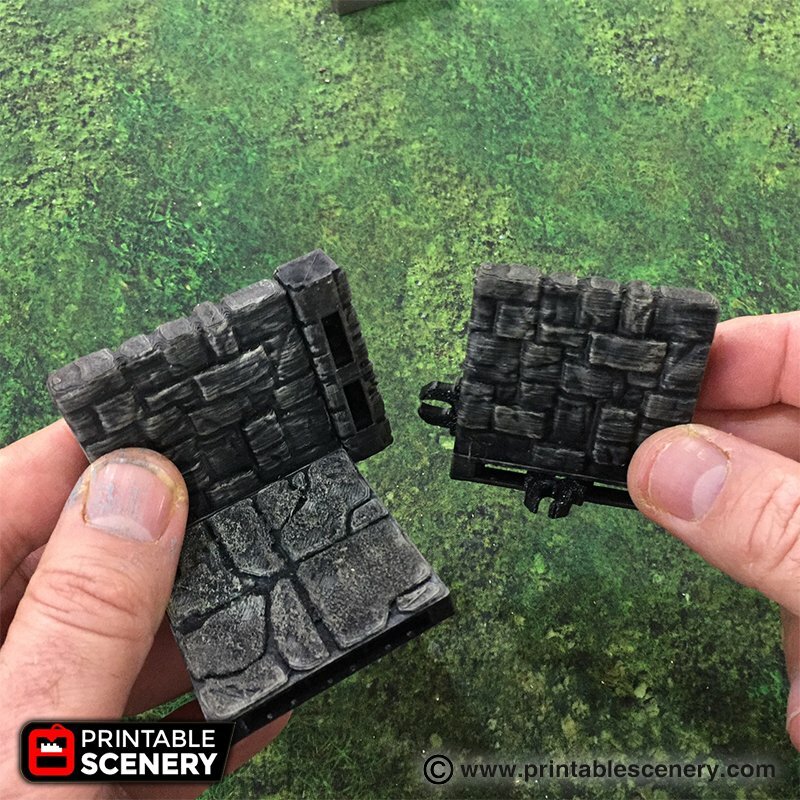 Is the only way to get stone floors buying the 9.95 stone floor package or is there any that would be included on this set? The E-TRP Floor tile is included in the pack. We do howsoever have a wide variety of different stone floor designs, but you will need to by those packs to get access to them. Is there an existing floor tile with a slot for the ‘A’ so it can be a ‘roof’ over the gate? 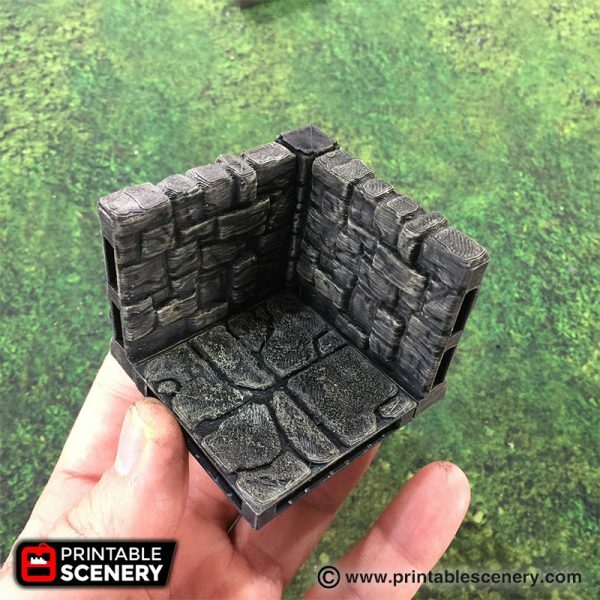 If not could you please make one and put some murder holes in the floor , so my kobolds can slam the gates down in front and behind the and then pur boiling oil down on the adventures! The two products i recommend are the RPG- Murder Holes, and the Castle Floor packs. Let us know if that is what you are looking for. 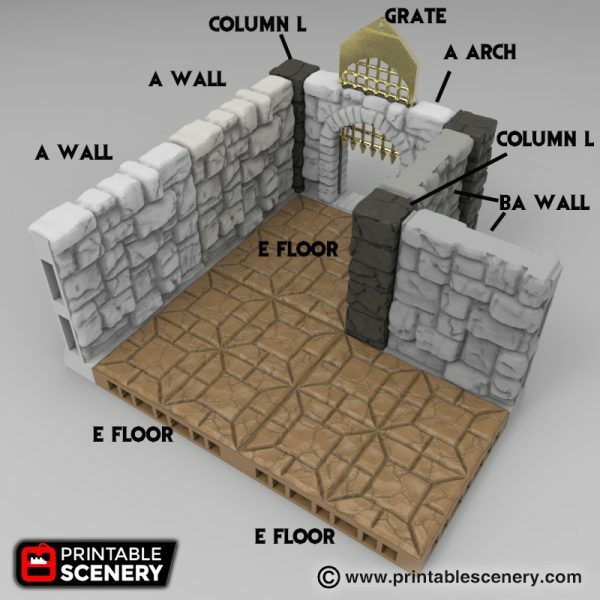 Not quite the idea is they come in through the entrance tile seeying the first arch tile (no gate) then a floor tile then the second arch (also no gate) when the party move onto th floor tile then the kobolds in the room on the second floor slam the gat4es down and pour boling oil on the adventures. I tried printing the walls and floors vertically with a skrt and I got good adhesion but a stringing mess afterword. It’s very frustrating. I’d like to purchase products but I’m apprehensive. What are your recommended print settings? Can you print vertically? Do you recommend a raft? Thanks in advance. Printing vertically with a raft is an option we use frequently for doign floors. If you have a stringing mess it’s usually to do with calibrating your z settings correctly or your tile is oriented so it can get knocked over. If you orient the tile so it’s in parallel with the bed motor it works better. 101 Hero, Cabinet Autonivel, QIDI TECH DOUBLE ? As long as you run the STL (universal file) through the slicer configured for your printer it should be fine. I hope this isn’t a very dumb question, but since I see it everywhere: What does TRP stand for? This is more of a generic question – For all models not just the RPG base Pack. First i love the models and I am currently downloading all the Demon Elves and Dwarven Terrain. 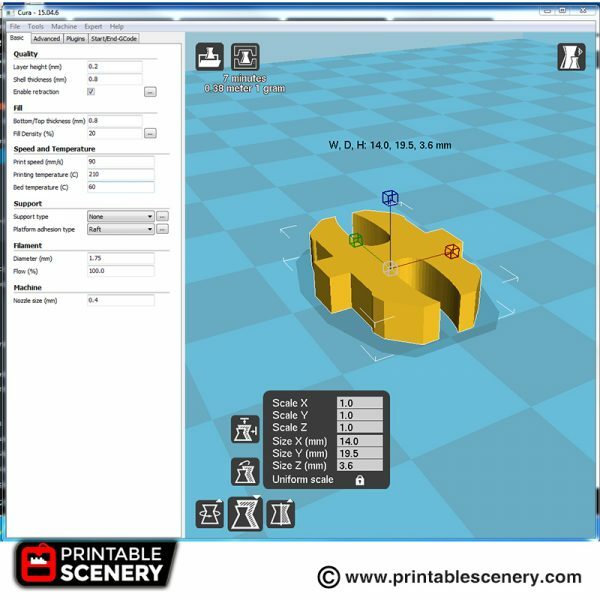 All of your files come with a great reference sheet, Would it be possible to add the standard print profile info to these. 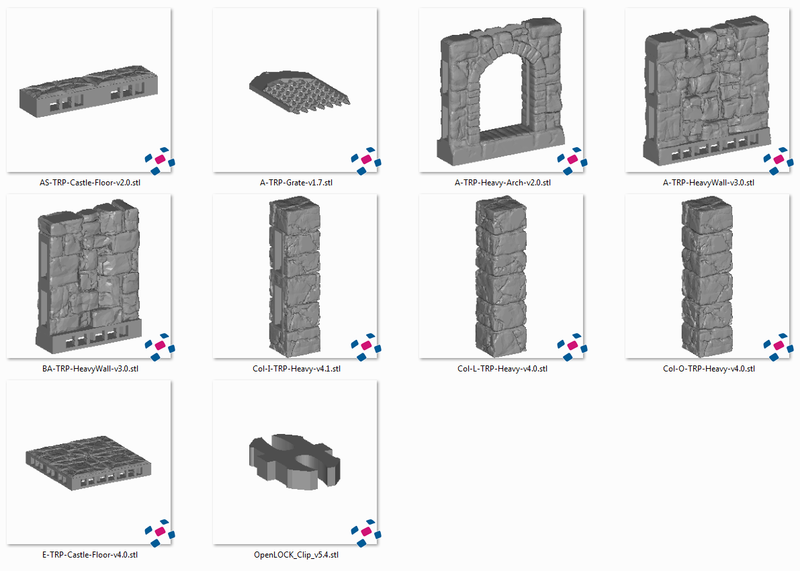 For example .2 layer height, 6 top / 6 bottom, 15% infill, speed… and such. 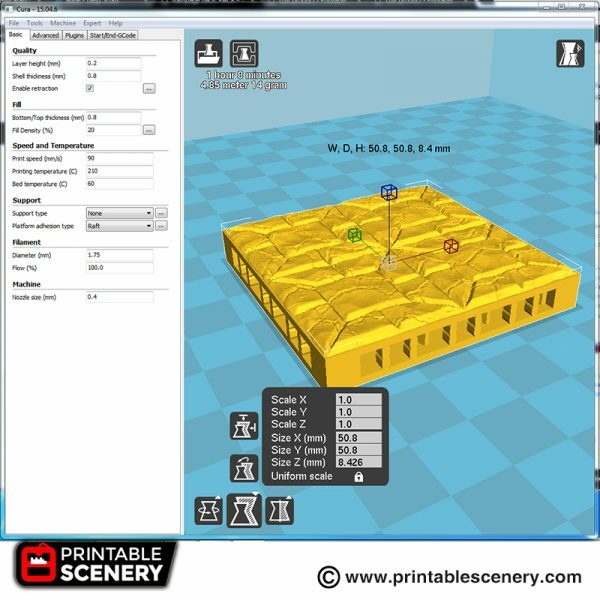 It would save time from goign to the web site between different prints and models. 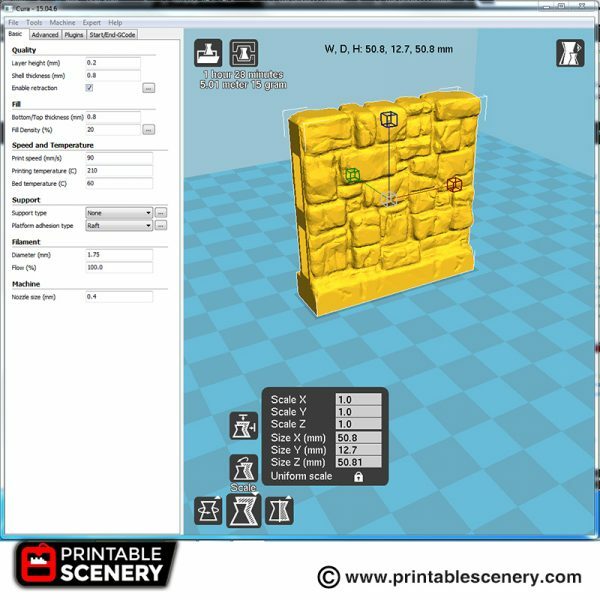 There is no standard print profile, some things print with different settings depending on the model. So the Rampage heavy walls sent me here to get the matching columns, but this pack is also missing T and X columns. Where can these vital pieces actually be found? Sorry, There are X columns in here.